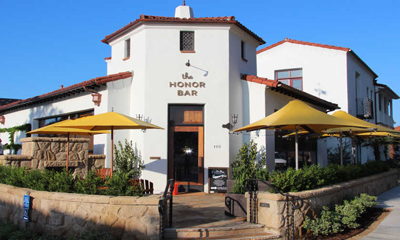 At Honor Bar in Montecito you’ll find an exquisite wooden bar in the center, surrounded by cozy booths. This tiny space also sports an exhibition kitchen where you can watch all the action. Outdoors enjoy a cocktail and assortment of snacks at one of our patio tables or relaxing Adirondack chairs— dogs are always welcome!